Drains frequently blocking due to root damage? Old or damaged drains needing replacement or repair? Looking for a cost-effective drain repair solution? Call us here at ECS. We do all our own drain repair work, so the company you call is the company who does the work (i.e. us!). We work to the highest standards to resolve your issue effectively and efficiently for the long term. Getting the correct diagnose of the problem with your drains is crucial. We use CCTV surveys and other methods to assess the extend of the damage. We then choose the best modern repair method, potentially saving you hundreds of pounds over traditional drain repair and replacement. If you’re worried about the disruption and costs of replacing drains, relining saves you time, money and a lot of disruptive digging! Our team can re-line your pipes with a new internal sleeve that sticks to the old pipe, ideal for pipes and drains that run under your home, garden, driveway or prize rose beds. If damage is limited to just a short section of a foul drain, storm drain or private sewer pipe, we can apply a patch lining to fix the problem without disruption. For installation of new drains and pipes, ECS offer moling services. This technology pushes steel rods underground forcing a hole that then allows a new drain line or mains water line to be inserted. Please note that moling may not be suitable for all applications of ground conditions. Renoline is a new pipe material similar to GRP (glass reinforced plastic) that is far superior in quality and strength to the pipe or drain you wish to line. The new Renoline pipe will be moulded into your existing pipe by the ‘inversion’ method. When complete, the new pipe will be rigid and tightly fitted to the existing pipe with only a minimum loss of cross section of approximately 6%. Renoline can be used for patch lining sewers, vertical rainwater down pipes, etc. Accepted by local authorities, loss adjusters, surveyors, etc. 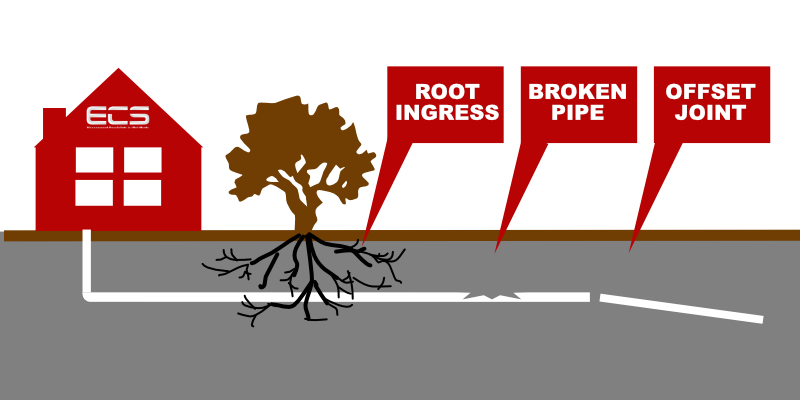 For more details, or to book a drain repair assessment, call ECS today. We are always happy to discuss the many options available to carry out repairs to damaged drains.